"My momma's spin on cucumber salad. A personal favorite of mine! Keep refrigerated until ready to eat." 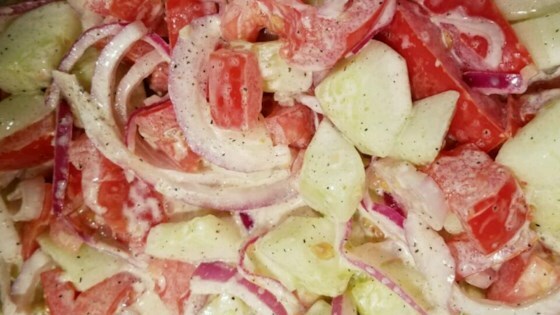 Mix cucumbers, tomatoes, and onion together in a bowl. Stir mayonnaise, Italian dressing, salt, pepper, and garlic together in a small bowl until smooth; pour over the cucumber mixture and toss to coat. I left out the garlic since there's already garlic in the Italian dressing, and I used cherry tomatoes cut in half. I made this exactly as written & it turned out well. I found it tasted better if made ahead and refrigerated overnight, I will be making this again. This is very delicious. I like to use this when I get tired of my other cucumber salad. I will be making this a lot in the future. I made this for the family and was floored to see my three year old and one year old finish it and ask for more. They are the pickiest eaters I know. Will definetly make it again. We brought this salad as a side dish to a dinner party and it was a huge hit!